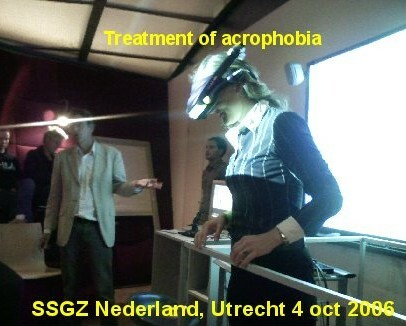 VRET (Virtual Reality Exposure Therapy) is effective for patients with acrophobia, arachnophobia and fear of flying. The effectiveness of VRET in other anxiety disorders like claustrophobia, fear of public speaking, fear of driving, post-traumatic stress disorder, and agoraphobia also holds promise for the future. In the science-fiction thriller The Matrix, the heroes “plugged in” to a virtual world. While their bodies rested in reclining chairs, their minds fought martial-arts battles, dodged bullets and drove motorcycles in an elaborately constructed software program. This cardinal virtue of virtual reality—the ability to give users the sense that they are “somewhere else”—can be of great value in a medical setting. Researchers are finding that some of the best applications of the software focus on therapy rather than entertainment. In essence, virtual reality can ease pain, both physical and psychological. 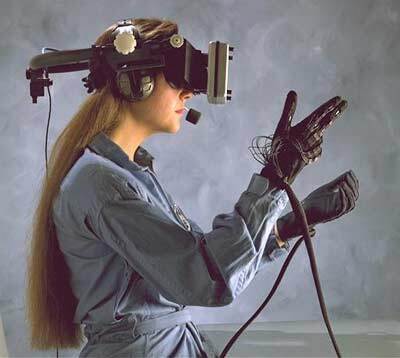 One alternative to traditional exposure therapy is virtual-reality exposure therapy. This kind of therapy uses a virtual reality unit to simulate situations that cause anxiety in phobia patients. It has several advantages over traditional therapy. Doctors don't have to leave their offices. Scheduling treatment is easier. It's less expensive in the long run. And patients are often more willing to participate in a program they know will allow them to deal with their fears in a nonphysical setting. Since patients can undergo therapy inside the doctor's office, confidentiality isn't an issue. SPIDERWORLD is a virtual-reality program designed to help phobic patients overcome their fear of spiders. 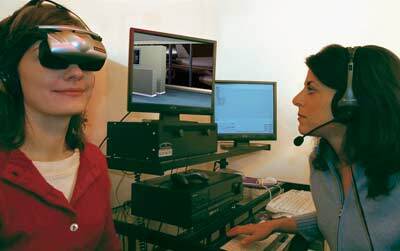 The patient wears a headset that shows a virtual tarantula (screen shot from program is shown in background). 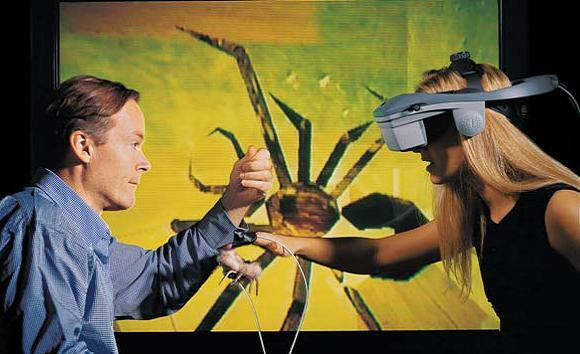 To provide tactile feedback, the system tracks the positions of a toy spider (suspended by the author, at left) and the patient’s hand, allowing her to “touch” the virtual creature. FEAR OF PUBLIC SPEAKING can be treated using a virtual-reality program developed by Virtually Better, a software company based in Decatur, Ga., that leases its programs to psychologists and psychiatrists. 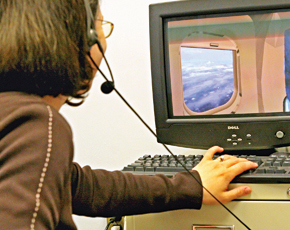 Ken Graap, the company’s chief executive, practices a speech in front of a virtual audience, shown on his headset and on the computer monitor. 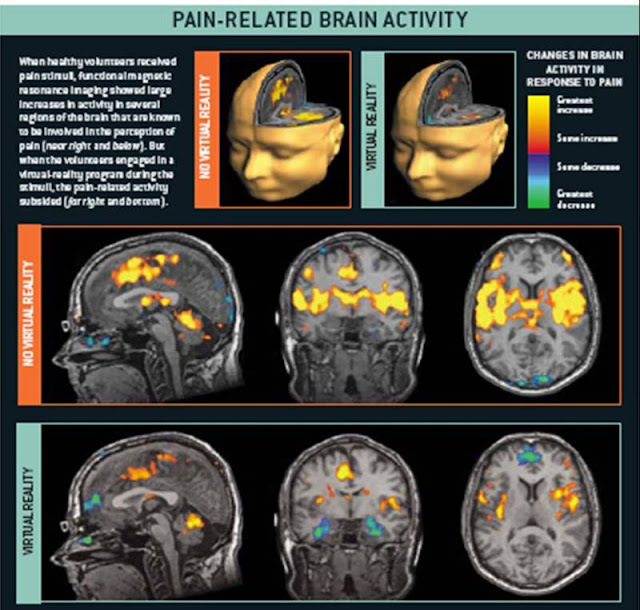 When healthy volunteers received pain stimuli, functional magnetic resonance imaging showed large increases in activity in several regions of the brain that are known to be involved in the perception of pain (near right and below). But when the volunteers engaged in a virtual-reality program during the stimuli, the pain-related activity subsided (far right and bottom). 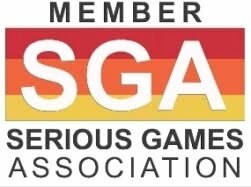 Computer simulations help Asperger Syndrome patients work through difficult situations in a safe, virtual world. Researchers at the University of Texas at Dallas Center for BrainHealth are working with patients diagnosed with Asperger Syndrome using virtual reality training. People with the disorder have normal intelligence, but they suffer from a variety of social cognitive defects, including an inability to read nonverbal clues and adapt well to change. The virtual world includes settings commonly encountered in everyday life such as restaurants, shops, offices, apartment living and parks, where they can meet “new” people in a safe, controlled environment. For example, if the goal is applying for a job, their avatars substitute for them as they practice their interviewing skills with real people on-line until the fear and anxiety of a real encounter with a potential supervisor diminishes. This method is distinct from role-playing, which is a widely used method, in that they feel the same emotions as they would in direct encounters. Virtual reality provides a therapy tool to rewire the brain through practical experiences that can be manipulated in ways the real world cannot, says Dr. Sandra Chapman, director of the Center for BrainHealth. “The clinicians can change the virtual world to increase the complexity of the exercise, control for sensory overload, provide motivation, and record feedback,” said Chapman. “Unlike other models of intervention, virtual world experiences provide a powerful way to learn new and more appropriate ways to respond to people in scenarios similar to those faced everyday,” she said. Before entering the program, the participants undergo a series of brain imaging measures and neurocognitive tests. At first, they practice with their avatars with a clinician by their sides. Quickly, new persons/avatars are introduced to the client and they begin to interact with family members and trusted friends. In addition to the virtual-world therapy, the young adults receive plenty of one-on-one coaching as they are trained to develop the insight to assess their own responses. At first, they watch recordings of their interactions, and gradually they are expected to modify their behaviors to fit the context in real time. 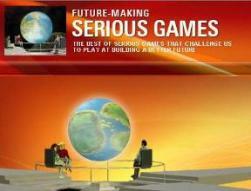 The idea is to train their brains in new ways of thinking in contexts that closely mimic real life. That goal is to stop unhelpful responses before they can start. Although still in the early stages, the BrainHealth researchers say they can detect dramatic improvements with many of the participants in terms of simple awareness of their social problems, which they say is the first step to improvement. 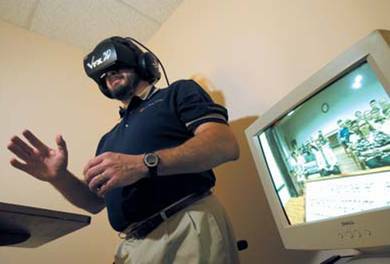 Virtual-reality therapy has become a new tool in brain rehabilitation. Therapists are using the gaming technology for people who suffer from autism spectrum disorders, schizophrenia, attention deficit disorder, addictions, strokes and brain injuries.